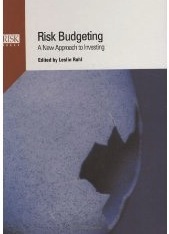 This is a practical and authoritative introduction to the concept of risk unit allocation as an alternative and more effective decision-making process for long-term investors. It sets out to help investors make an informed decision about how to implement and execute a “risk unit allocation” investment policy, and analyzes techniques to assess how risk might impact long-term investment returns. The book also introduces methods to allocate assets based on the “risk unit” exposures – in individual asset classes and on a portfolio basis, to meet long-term pension obligations and investment return objectives. There are contributions from leading experts drawn from consultancies; large institutional investors; pension plans; investment banks and academia. This entry was posted in Books and tagged investing, portfolio allocation, risk budgeting. Bookmark the permalink.